Kenya Defence Forces units assigned to the African Union Mission in Somalia (Amisom) are failing to enforce a ban on charcoal exports by Al-Shabaab, a team of United Nations monitors charges in a new report. Shabaab earns at least $10 million (Sh1 billion) a year by shipping charcoal from ports in southern Somalia where KDF units are stationed, the UN panel says. "Amisom, whose Kenyan Defence Forces contingents remain deployed at the ports of Kismayu and Buur Gaabo, has neither assisted the Somali authorities in implementing the charcoal ban nor facilitated Monitoring Group access to charcoal exporting ports," the report states. Poor implementation of the five-year-old UN Security Council ban "enables Al-Shabaab financing and undermines counter-terrorism and counter-insurgency efforts in Somalia," the report observes. As an example of Shabaab's continuing ability to thwart counter-insurgency efforts, the UN team cites an attack on a KDF base at Kulbiyow on the Kenya-Somalia border that killed at least 67 Kenyan soldiers. Shabaab militants have also taken the lives of scores of civilians and police officers inside Kenya in the past two years. It is not the first time UN experts have made allegations of KDF non-compliance with the charcoal-export ban. 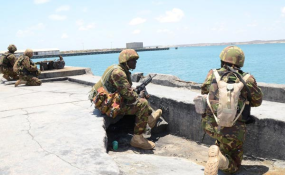 The UN's Somalia and Eritrea Monitoring Group said last year that Kenyan troops assigned to Amisom were receiving $2 (Sh200) per bag of charcoal illegally shipped from the port of Kismayo. Kenyan forces' collusion in the illicit trade may have brought them $12 million (Sh1.2 billion) in proceeds, the 2016 report suggested. The January attack on the KDF's Kulbiyow base also resulted in Shabaab's capture of weaponry that included a 105mm howitzer, an armoured personnel carrier, an 81mm mortar launcher and a heavy machine gun, the new report adds. Shabaab is further said to have used more powerful 120mm mortars, likely seized from an Amisom Burundian base in 2015, in an April attack on a joint Uganda-Somali National Army base at Baledogle. Weapons of that calibre represent "a new and significant threat to peace and security in Somalia," the report warns. In another worrisome sign of an increasingly diversified Shabaab arsenal, FBI laboratory analyses have shown that the insurgents are now using an ingredient in fertiliser to make vehicle-borne bombs, the UN team says. "The potential use of home-made explosives by Al-Shabaab would allow the group to rely less on the process of harvesting explosives from munitions, which is slow and laborious," the monitoring team points out. Additional weapons are being illegally imported into Somalia via the country's Puntland region aboard dhows sailing from Yemen and the Makran coast of Iran, the report finds. At a meeting in September with UN monitors, "Iranian authorities strongly denied any state involvement in the shipment of weapons to Somalia," the report notes. Along with revenues from charcoal exports, Shabaab finances its operations partly through "taxes" it levies on vehicles traveling on roads it controls, the UN team says. "Large trucks are usually taxed $1,000 Sh100,000), with receipts issued by Al-Shabaab to prevent double taxation at subsequent checkpoints," the monitors recount. Other monthly fees extracted by Shabaab range from $10 (Sh1,000) paid by market traders to as much as $70,000 (Sh700,000) paid by major companies, according to the report. Somalia's federal government has warned businesses against supporting Shabaab financially, the monitors note. But because the government has only limited capacity to monitor such payments, the warning is unlikely to have much effect on Shabaab's taxation of business interests, the report adds. Federal institutions likewise remain "incapable of addressing pervasive corruption," the monitors observe. The electoral process earlier this year was treated by the country's elite as another opportunity to "capture or maintain control over state resources in Somalia at the expense of peace and security," the report asserts. Sums of cash were handed out to electors choosing a president last February. Other countries became involved in the vote-buying, with the United Arab Emirates said to have been particularly overt in making such bribes. UAE representatives frequently summoned Somali regional administrators to meetings "where they were given cash to persuade their regional members of Parliament to vote for that country's preferred candidate," the report says. The UN experts' generally pessimistic assessment of the security situation in Somalia includes the finding that a faction of the Islamic State of Iraq and the Levant (ISIL) has grown significantly during the past year. ISIL loyalists in Somalia numbered no more than a few dozen in 2016 but the group now includes as many as 200 fighters, the report says. "The ISIL faction has demonstrated increasingly sophisticated recruitment methods, largely targeted at disaffected members of Al-Shabaab in southern Somalia," the UN team notes.